And the blog tour continues with my thoughts on the awesomeness that is this book. If you haven't already done so, you should definitely check out my interview-ish thing with Marie, and enter to win a The Winner's Curse prize pack! I'm really afraid I'm going to spoil something about this book for you guys, which I don't want to do at all, at all, at all, so I'm going to try very hard not to, which is going against everything in me that just wants to discuss this book. I've been seeing a lot of unreserved "this is the best thing evarrrr" reviews on the interwebs for The Winner's Curse, and I'm not quite there — there were a couple things that, well, not necessarily bothered me, but seemed less perfect in this otherwise really excellent book. But for the most part, I ate this book right up, and I feel pretty confident in saying that this series is going to be big, and you're going to want to read it now, so that when it's this huge thing everyone's talking about and there's a movie in the works with the most current incarnation of JLaw, you can be all hipster and say you read it ages ago. 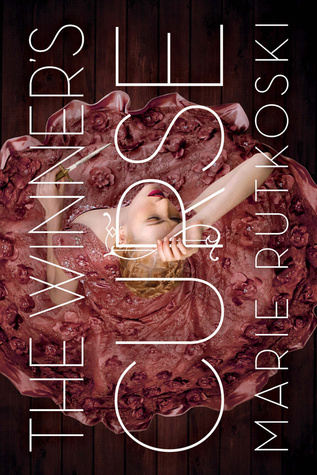 The Winner's Curse reads like historical fantasy, but it isn't quite either of those things. It's very rich in the telling, with seamless, full world-building, which I think plays into the historical fantasy feel (those two genres being arguably the most dependent on truly excellent world-building and a very luxe style). You can feel the weight of history in this story; everything seems to have its place, from the clothes they wear to the food they eat to the games they play, and everything in between. You get the sense that there are reasons to everything, and that there's also more to the story — more, even, than you could ever know. That is one of my favorite things about good world-building — when you feel like, as good as it is now, you've barely begun to scratch the surface. It feels like there's so much more, that there's a history and a cultural story that the author didn't just luck into, but thought about — researched and planned and truly understood, and then pared down to what was needed for the story being told (so that it's rich and lush without being Infodump Overkill). That is what makes for good world-building. One of my favorite things (which you may have guessed, since it's what I chose to discuss with Marie for the blog tour) is actually the culture-building aspects of the story. The Herrani and Valorian cultures both feel very real and immediate to me; the use of culture and all its hallmarks, both as a means of differentiating (both for the reader and for the characters "living" it), and as a means of bringing together and showing how alike people really are, no matter how hard they try not to be, was really well done. The two cultures and their backstories were distinct and interesting, and permeated the entire story, building a sense of place, and of a visual, palpable world. The reader is able to really feel the pace of life and the atmosphere, and be that much more engaged in the story as a result. Rutkoski gives enough detail on these cultures and their uneasy coexistence that you're always able to visualize the world — you can see Kestrel and Arin playing a game of Bite and Sting; you can picture the Herrani-turned-Valorian households, the clothing, the market. Everything feels very concrete and — for lack of a better term — camera-ready. Now, I referenced a couple of minor reservations in the beginning of this review, so I do want to address those. I don't unreservedly love this book, but what reservations I do have are pretty easily outweighed by the things I loved. The timeline pre-book seems a bit too compressed to me; I would much rather the political/societal state be more entrenched and further along than a war that happened a scant decade ago. This is nit-picky, of course, but from a tension level and a convenience level, I personally would appreciate it more if both Kestrel and Arin were raised in a world where the current status quo isn't all that new, as I think it'd make their internal struggles and the conflicts more heightened. I mentioned convenience — having the war be in very recent times does allow the characters to somewhat remember a nebulous before, which helps in the Explaining of the Things, so I get it; but frankly, I've never been one to respect convenience in storytelling... It can seem too much like a plot crutch. But as I said, this is mostly nit-picking, and for anything that detracted or made me question, there were a dozen other things that made me love this. I have a feeling that my enjoyment of the world and characters over the course of the series is going to grow exponentially. It's a meaty story, and I think as things unfold, there's going to be so much for me to sink my teeth into that I' going to eagerly await further installements, and push this on just about, well...everybody. So seriously. You should probably pre-order this one. *People who don't love this quite the way the rest of us do seem to disagree with me on this point. Instead, they found the pacing slow in the beginning, and liked how quickly it moved at the end, so I guess it's all down to taste. I'll take a book that prizes development and paces accordingly any day. I like the idea that there is a lot going on in this one and that the author takes the time to build a solid foundation with it for the series. Thanks for putting together some thoughts on the book and still not giving away any spoilers. I got to read an advanced copy last year and really enjoyed it. Great world building and characterization, and you're right about the "slow burn" - all made it a compelling read. I keep seeing this book, and everyone seems to love it. I might have to read it. I KEEP hearing that I need to pre-order this. Which makes me utterly excited!!! My eagerness to read this book has upped exponentially in the last couple of weeks. Glad you enjoyed it!! I love the cover! World building is huge for me so your review defiantly made me want to read this even more. thank you for bringing this book to my attention!!!! What a cover! This story sounds interesting and different. I am curious about the culture building! I am also curious about the pacing now. :) Thanks for sharing! Thanks for the review! I love books with extensive culture-building so I'm super-excited for this one! I want to read this so bad! I love a book with a great worldbuilding setup and thanks for a mostly spoiler free review! This review has me anticipating the book even more! The cover, the story premise, and the execution as you pointed out, would only mean one thing--- a great novel. I'm excited! It's nice to hear what didn't work for someone in a book with so much praise so I appreciate that. I tend to read slow so I'm wondering how the overall pacing will be for me. Thanks for sharing! I'm also really excited for the cultural aspects of the story! It seems like such a rich alternate world, and that's definitely a plus for novels like this. love the world building and the dynamics between the two main characters sound absolutely perfect, my type of book. Sounds very character driven! which makes me even more exited. I haven't seen anything bad about this book yet! This is a great review! I've read a chapter sampler from Amazon and I'm already intrigued!